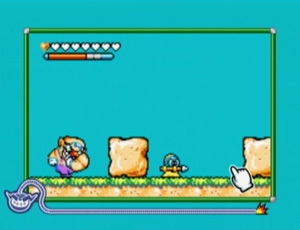 Released at the same time as WarioWare: D.I.Y., Showcase is a WiiWare title that allows users to upload their D.I.Y. 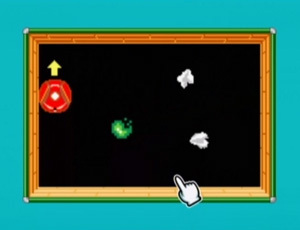 microgames and play them on a TV with a Wii Remote. The game also comes with 72 more built-in microgames to play. 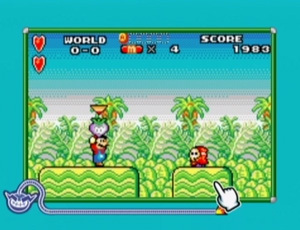 The game can also connect to the same download services as the Nintendo DS game to upload and download games, music and comic books. 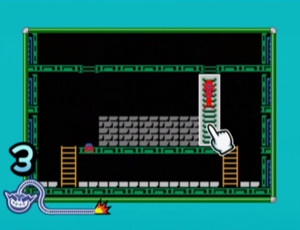 While 9-Volt hosts the retro Nintendo microgames on WarioWare: D.I.Y., his best friend 18-Volt hosts them on Showcase. 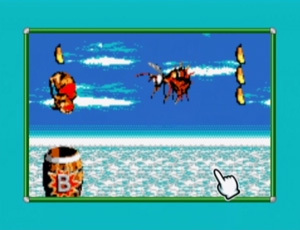 He is introduced in the style of an 8-bit top-down shooting game called "Jet 18-Volt". Based on Super Mario Kart (SNES). 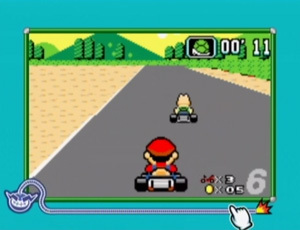 Press A at the right time to shoot the Green Shell at Koopa Troopa and make him spin. Based on Donkey Kong 3 (Arcade/NES). Press A to shoot Donkey Kong twice, but don't hit the worms. Based on Wario Land 4 (Game Boy Advance). Press A to make Wario break down the block and then take out the speared enemy. 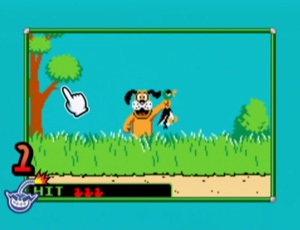 Based on Duck Hunt (NES). Aim and shoot at the ducks to take them all down before they fly away. Based on Super Mario World (SNES). Press A to make Mario swoop upwards with his cape, collecting Coins and avoiding the Super Koopa. Based on Donkey Kong Country 2: Diddy's Kong Quest (SNES). 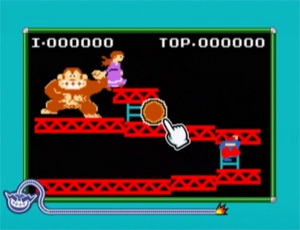 Press A at the right time fire Diddy Kong out of the barrel and collect all the bananas, but avoid the Zinger. Based on Donkey Kong (Arcade/NES). Press A while pointing at the rolling barrels to clear them out of Mario's way. Based on Famicom Wars (NES). 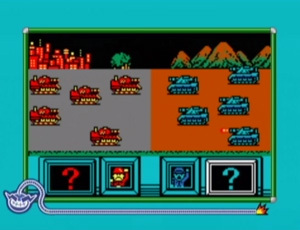 Wait until the tanks blow each other up, then tap on the side you think won the battle. Based on Mike Tyson's Punch-Out!! 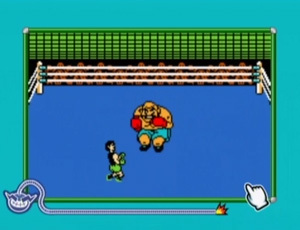 (NES). Press A at the right time to dodge Bald Bull's attack. 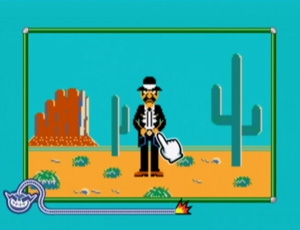 Based on Wild Gunman (NES). When the gunman says "Fire! ", press A to shoot before he shoots back. Based on Wrecking Crew (NES). When the Gotcha Wrenches climb down the ladders, break down the ladders with the A Button. Based on Mario Bros. (Arcade/NES). Press A at the right time to jump up and knock over the Shellcreepers and Sidesteppers. 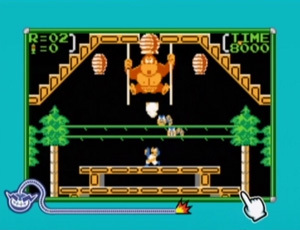 Based on Clu Clu Land (NES). Press A when pointing at Bubbles when it is safe for her to turn, avoiding the Urchins. 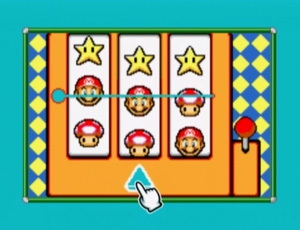 Press A on the blue arrows to line up either three Marios, three Mushrooms or three Starmen (from the Mario series). Based on Kid Icarus (NES). Tap on all of the item jars on the screen. 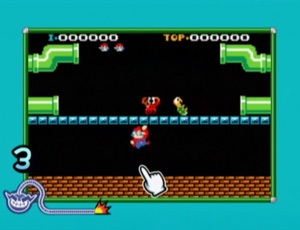 Based on Super Mario Advance (GBA), itself a remake of Super Mario Bros. 2 (NES). 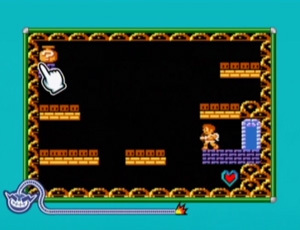 Press A at the right time to throw the Vegetable and defeat either the Shy Guy, Ninji or Giant Shy Guy. Based on Super Mario Bros. 3 (NES). 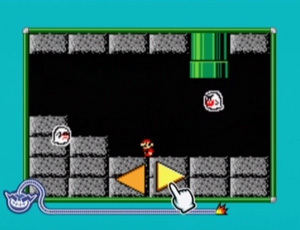 Press the large arrows under Mario to make him face in that direction and protect himself from the two advancing Boos. Based on Zelda II: Adventure of Link (NES). 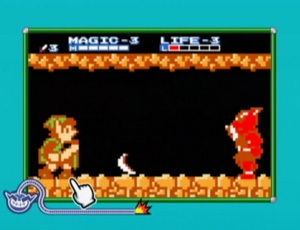 Tap Link to make him stand or crouch, deflecting the boomerangs thrown by the Goriya. Based on the classic Nintendo toy Chiritorie, a remote controlled mini vacuum cleaner. Press A to start and stop the Chiritorie from moving, and it will rotate in four directions when stopped or if it hits a wall. Clear up all the balls of paper by driving Chiritorie over them. A green fireball from Mario Bros. also gets in your way. 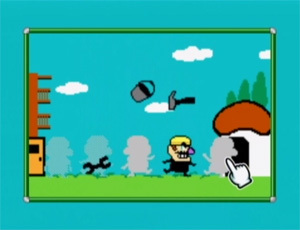 One of Wario-Man's microgames is based on the Game & Watch game, Helmet. 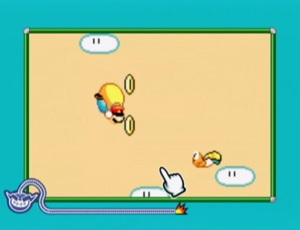 Move Wario to the open door and avoiding the falling tools. 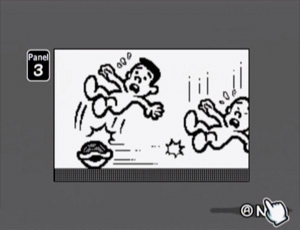 If you succeed, Wario will appear ringing a bell, as the alarm characters on the Game & Watch would do. The game's record player can either be played in "Listen" or "Play" modes, and are based on Balloon Fight. In Listen Mode, the WarioWare D.I.Y. music composer appears flying across the whole screen dressed as the Balloon Fight hero. In Play Mode, he appears small and you have to control him to collect as many notes as you can while avoiding the sparks and the fish. 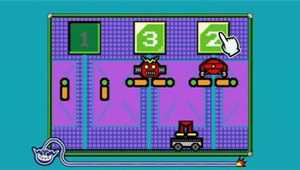 Three records are "18-Volt" composed songs from other games, although two are from other WarioWare titles. Fever theme from Dr. Mario. Mona's stage theme from WarioWare: Twisted! 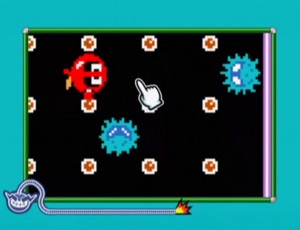 Dribble & Spitz stage theme from WarioWare, Inc.: Mega Microgames. One of 18-Volt's favourite comics is called A Koopa's Tale, and stars a kicked Koopa shell from Super Mario Bros.